We have tours for everybody! For the past 90 years we at Grand Canyon Airlines have developed the most pioneering and exciting ways to show our customers the Grand Canyon. What began as a humble charter service in 1927 has grown today to be the largest and longest-running air tour service in the world. We have reimagined what it means to experience this magnificent natural landform. Our tours offer the opportunity to explore the canyon from top to bottom. Soar over the massive rock gorges in an airplane or enjoy a raft trip along the Colorado River on the canyon floor. We look forward to another decade of innovation and creativity to offer you, our guest, the most breathtaking and memorable experience possible when visiting our nation's most treasured landform. Nearly a century before becoming the world's leading provider of airplane tours, Grand Canyon Airlines emerged into the virtually untapped industry as Scenic Airways. In 1928, our company built the Phoenix Sky Harbor Airport which today serves as one largest commercial airports in the United States. Our first flight from Phoenix, Arizona was not a Grand Canyon tour but a special charter to Mexico requested by the Rocky Point Fishing Club. Our charter services were also frequently utilized throughout 1929 by former Arizona Governor W.P. Hunt, who enjoyed hunting along the Grand Canyon's North Rim. In this age before television, nationally-distributed newspapers and magazines, and of course the internet, most people in the United States and across the world had never actually seen the Grand Canyon. Soon demand for Grand Canyon flights increased, and Grand Canyon Airways rose to the challenge. During this time these air tours were promoted for their speed, as just reaching the canyon (never mind exploring it) took days or even weeks to accomplish by ground. In 1967, Grand Canyon Airlines was purchased by Elling B. Halvorson. Halvorson was the owner of a construction company charged with the large and logistically-complex project of building a water pipeline from the North Rim to the South Rim of the Grand Canyon. Halvorson had initially used helicopters to transport lumber, piping, and other materials over the canyon. Locals who'd been watching the construction take place began to ask if they too could ride across the canyon gorge on Halvorson's helicopter trips. Immediately recognizing the demand for such rides, Halvorson was quick to begin development of aerial tour operations using both helicopters and airplanes. Today, Grand Canyon Airlines provides daily tours to the Grand Canyon as well as Antelope Canyon, Rainbow Bridge, Horseshoe Bend, Tower Butte, and other incredible sights throughout the American Southwest. Throughout our near-century of operations, we've had the honor of transporting over 100 million sightseers to some of the most beautiful areas of the desert Southwest. 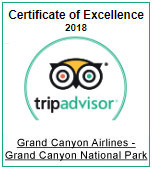 We at Grand Canyon Airlines look forward to bringing your family to the most treasured landmark in the United States: the Grand Canyon.